If I remember correctly, this photo of the picturesque house on the lake came from FaceBook. 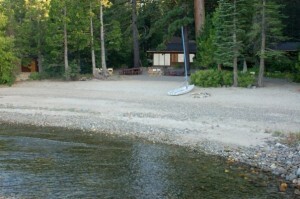 Alex was invited by his friend Galen, not forgetting Debra and Tony, Galen’s parents, to spend the weekend in their summer home on the west side of Lake Tahoe. That was an easy decision! Alex jumped at the chance, with thanks. Marie-Hélène and I decided to bring Charles along and visit too! Not for the whole time: even we could not be quite that brazen. But we stayed nearby for two nights and visited for a day, and all of us had a wonderful day romping around on the lake. Alex’s turn. From the left, Josh, Galen and Nathan are also there. 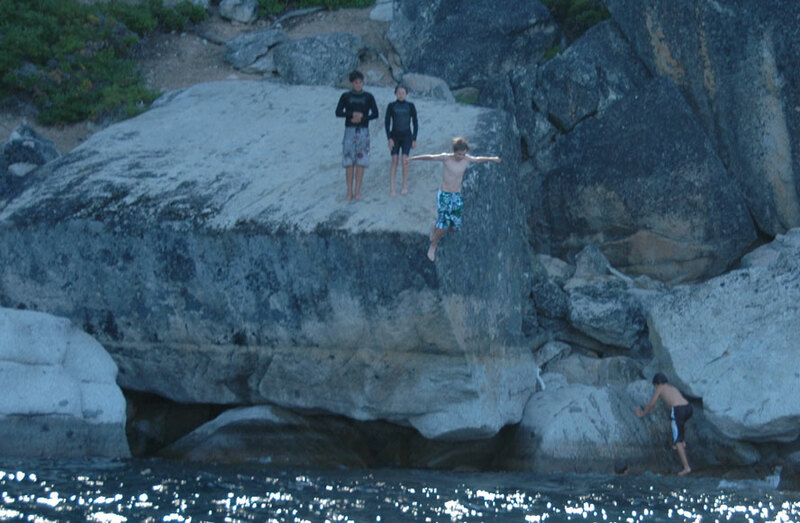 There were rocks to climb and jump off, and blasters to ride! (We didn’t know what they were either before this day out: see below). As soon as we arrived at Debra and Tony’s, where they had evidently planned their activities around our arrival, Tony launched us into his boat for a cruise along the lakeshore. The boat was moored just off their own little beach: this really is an idyllic part of the world. After about half an hour admiring the scenery and watching the lakeside drift by as we motored on, Tony dropped off the children next to these collection of granite boulders, which the boys called the “jumping rocks.” They swam over to them, climbed up like little monkeys, and began jumping in, one at a time. Charlie’s turn. From the left, Josh, Alex and Galen. The lake was very cold. It is 6,200 feet high, and filled every year by snow melt. 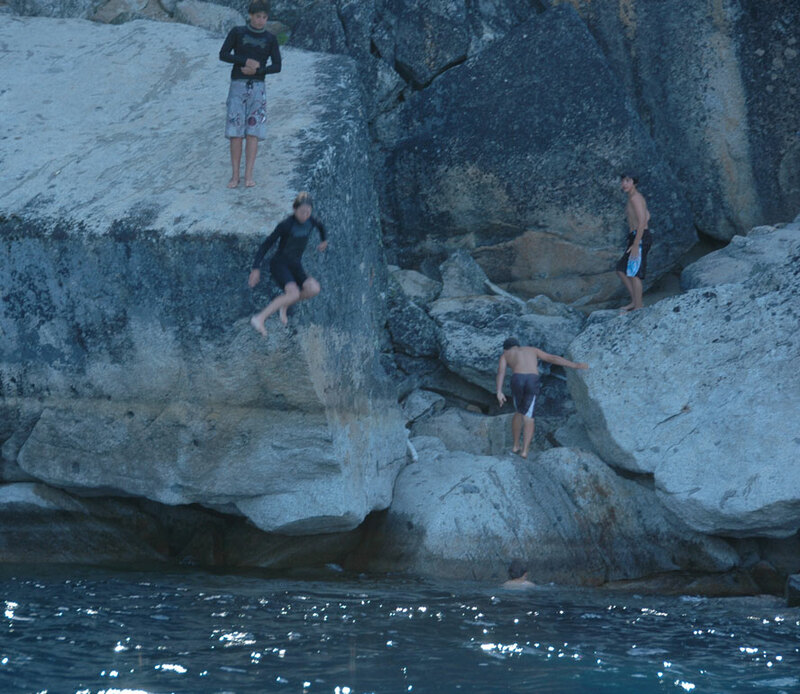 I can confirm the temperature, because I too jumped off the boat and swam in to those boulders. 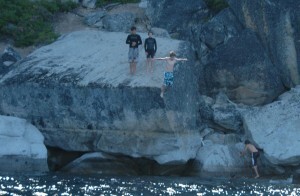 I even jumped off the boulders, but only once. That satisfied my aging honor! That water was very cold! After three years of relative drought, the lake water level was also low during the summer of 2009, and did not get back to normal until the summer of 2011. The line across the boulder about half way up is the normal water level. Alex blastering. The wind was whipping his hair back off his forehead. 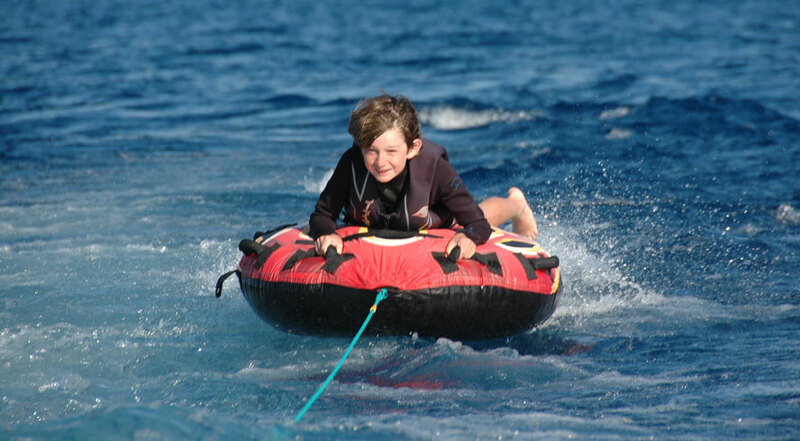 On the cruise back from the jumping rocks to the house, Tony gave each of the boys a good, long turn on the inner tube, racing along behind the boat. He cut the boat backwards and forwards when he felt that each was comfortable, so that the blaster would be towed across the boat’s wake. Oh yes, they all liked that! Charlie’s turn, complete with scenery. There were five of them altogether (Debra and Tony are very hospitable with their sons’ friends), and each had about five minutes hanging on for dear life. At least, that’s how it looked to me from a safe distance. None of the boys would ever have admitted such a thing of course. 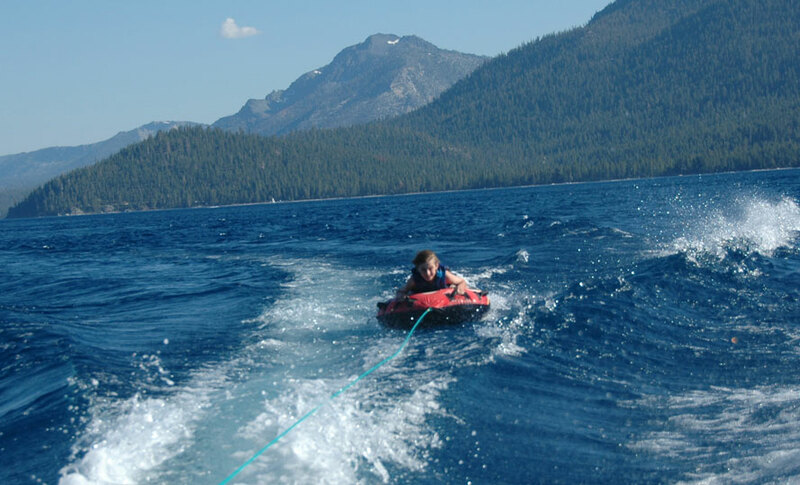 Each constantly asked to be the next to be towed along, and Tony was making 10-15 knots. Children do have great water activities nowadays. Marie-Hélène (in the shadow with a much needed glass of wine) and Alex watch Debra and Jasper (Galen’s younger brother) playing together on their beach. Check out that scenery! Once back on shore, Marie-Hélène and I hung around for a while, well for as long as we could, to be honest, without being rude. 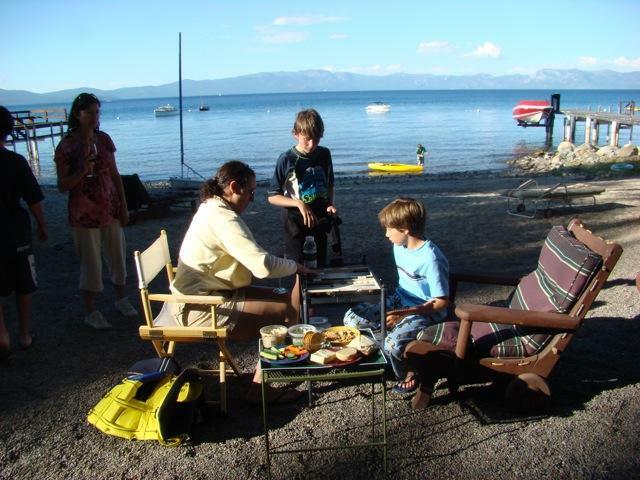 Debra and Tony had invited Charlie to stay on with Alex and maybe do some more water activities the next day. Needless to say, he too jumped at the chance! So the parents were on their own for the night. But it was obviously not a day to cut short precipitately. Beautiful day, beautiful place, what else can we say? Finally, more water activities. Galen and Alex are on either side of Tony as they collectively prepare to go out for a sail. This is the life! More to do on the water, this time with no outboard to help them along. 2009: Tom and Maureen Vacation in California!